Swoon Fine Art this afternoon and then working on set up. I'm excited and nervous all at once! But, there is no turning back now. I'm ready to go, and with some encouraging words from my friend Kymn via email as she is in Hungary right now I have a bit more courage to do so. Our bodies can possess different scars, both visible and invisible. Our visible scars are our body’s natural healing response to injury. Invisible scars are those emotional traumas or tragic events that can leave a lasting mark on our soul. They are invisible to others, yet to us they can be as significant as the visible scars. We sometimes look at both of these types of scars as shameful or embarrassing, or only see them as a reminder of a painful or traumatic event. I, however, look at both the invisible and visible scars as my body’s triumphant ability to heal. They are the roadmap to my personal history and tell my story—from the scar on my nose from a Crazy Carpet mishap when I was four to the emotional pain of witnessing my parents’ divorce or the six-inch scar on my abdomen from urgent surgery to remove a large tumor, and many, many more. In Evidence of Healing, I am not only reflecting on my personal history but imagining the history of others while creating each piece. I inflicted different traumas or injuries on most of the pots to then turn around and heal them using a variety of materials and methods. Each pot’s scarring shows the evidence of its healing – it’s not the same as it was but is still not only functional but beautiful in its own unique way. Some of the pots have no visible scars or injuries, and they represent those of us who carry some of our scars on the inside. The main reason I wanted to use everyday pots for this body of work was because they are so relatable to everyone. I listen to friends and family talk about how they feel about art and often the question is "but what is it?". They get so caught up in trying to relate to the form that the message is often missed. I wanted to use a form that we can all relate to so that the viewer can get right down to the message. I love throwing on the wheel. I love making useable objects that can exist in someones daily life. It connects me directly to the user and that is why I make pottery. So it is important to me that when I make a body of work that is more conceptual that I make everyday objects. So that was where I started for Evidence of Healing. 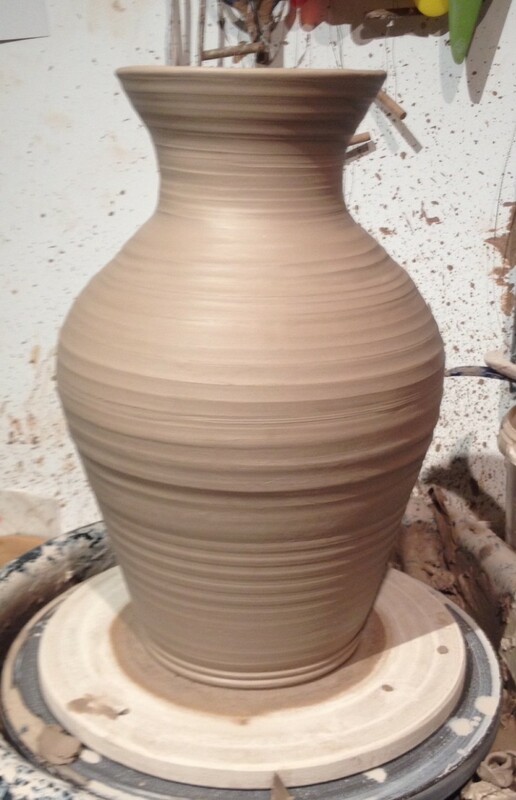 One of the first pots I made was this large vase. I threw the bottom third from about 10lbs of clay, and then built up the wall by adding coils slowly and throwing those coils. 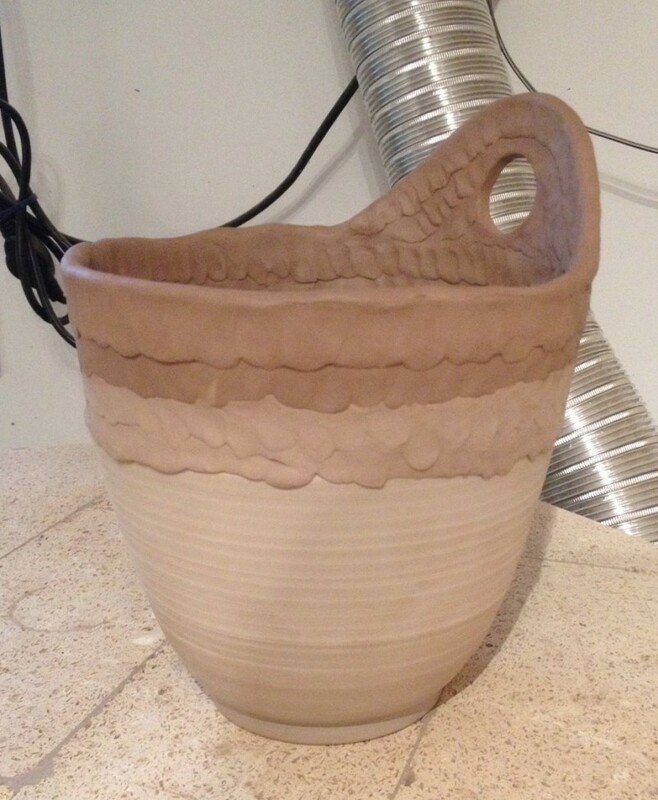 It ended up being about 16" tall and I was concerned because my kiln interior is only 15 1/2" tall. It ended up okay in the end as it shrunk to just under 15" when it dried so all was good. My kiln was bought second hand and is about 30 years old. All of it's functions are manual which means I have to be there the entire time to turn it up, watch the temperature and turn it off when it's done. 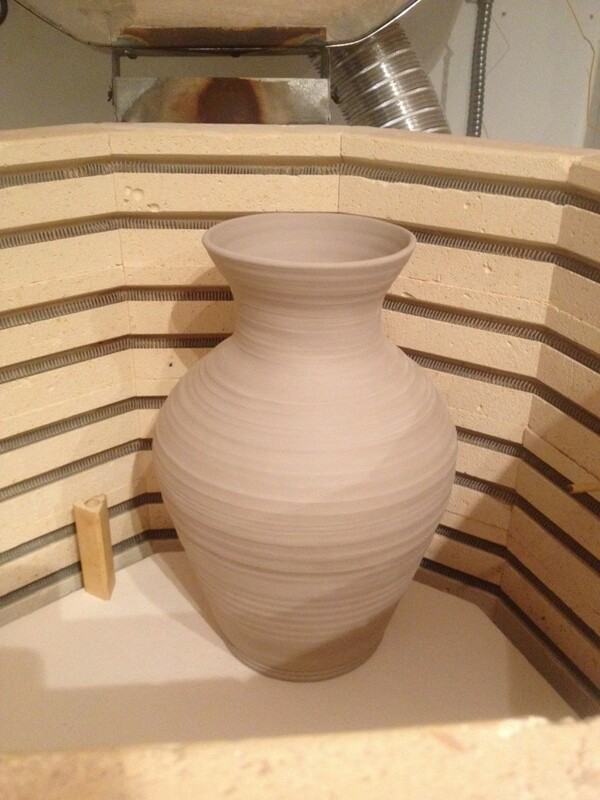 It's a really good kiln and in good condition so even though I would love to have a new, computerised, and larger kiln, I love this one. What you can't see in these photos is a large hole that I punched out of the side of the vase. I then drilled small holes around the large hole so that I could seal the hole with another material. I will post finished photos of the work after the show is over for those unable to make it in to see. 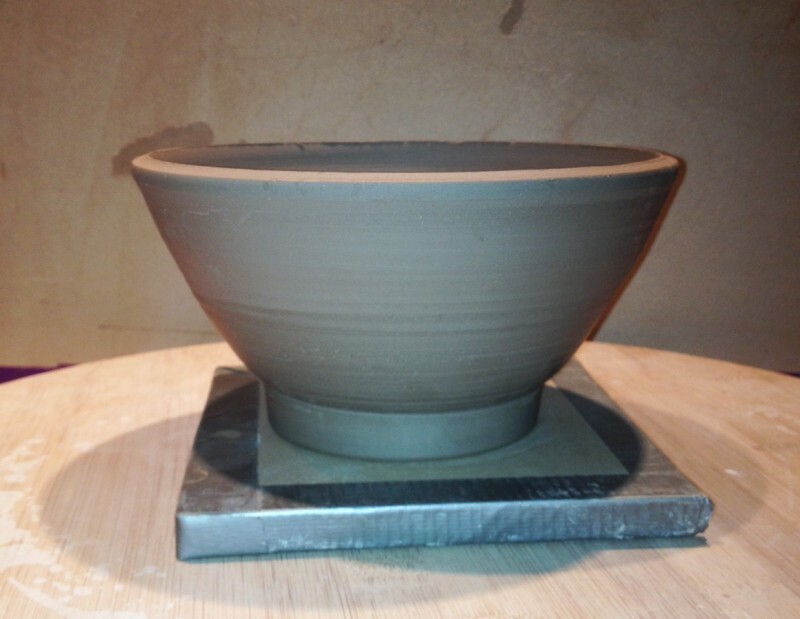 So as I said, I love throwing, I have always been a thrower, and the times I have tried working on hand building have been moderately successful. I just prefer the look, feel and process of throwing. For this body of work however, I wanted to challenge myself and my way of working. My throwing is often described as "tight". This means that I throw in a very controlled and clean way. I may leave throwing lines in my pots but they are uniform, there is balance and symmetry to my pots and I don't alter the forms in any way. This is not a bad or a good thing, it just is. I did want to challenge it in a way though as I think it will make me better. So my concept behind some of the pieces was to throw part of the pot and coil build the rest of it. In a broad reference to prosthetics, I would use hand building to finish something that was cut off. This is the first step, the base was thrown and trimmed and I cut off the top bit of the bowl as a starting place for the coils. Here the first coil is added. When adding the first coil, I had to make sure the base pot and the coil were at about the same moisture consistancy to ensure that they would stick together and not crack apart. It turned about that this reclaimed clay body I mixed up was super strong and I had virtually no cracking for all of the pots I made. Here are a couple of pots with the second coil added. I employed the Matt Wedel way of working. He was a visiting professor at NSCAD during my 3rd year there and he would make these huge sculptures and would be able to finish making work in an incredibly short amount of time. He would be working on three at once and would rotate between them all so that by the time he finished a section on number 3, number 1 would be dry enough to add onto again. 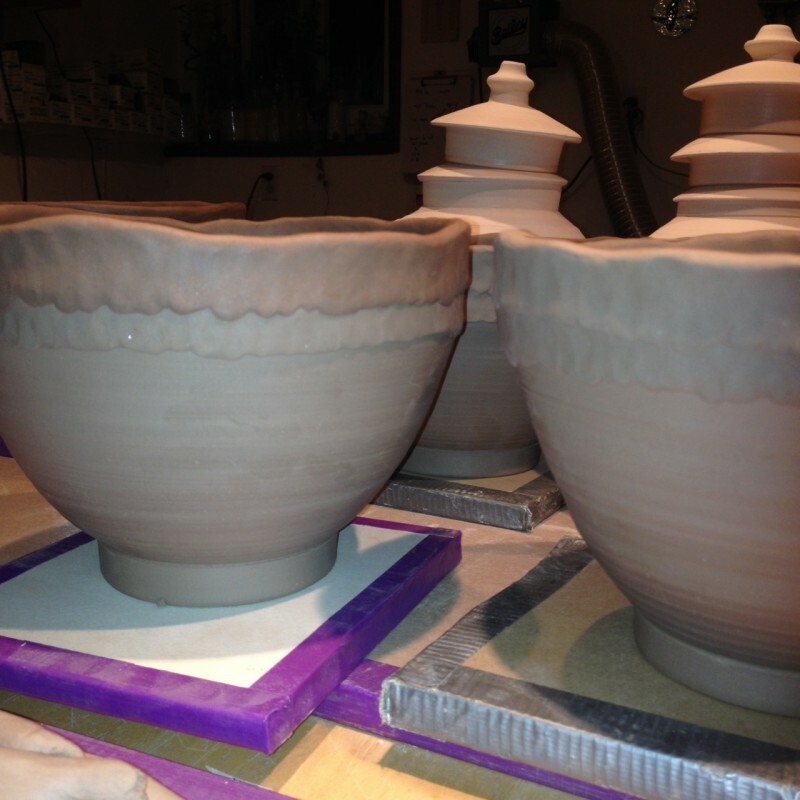 I think that night I worked on these I finished 6 pots in about 4 hours. It was so much fun, I think I could have made another 6. 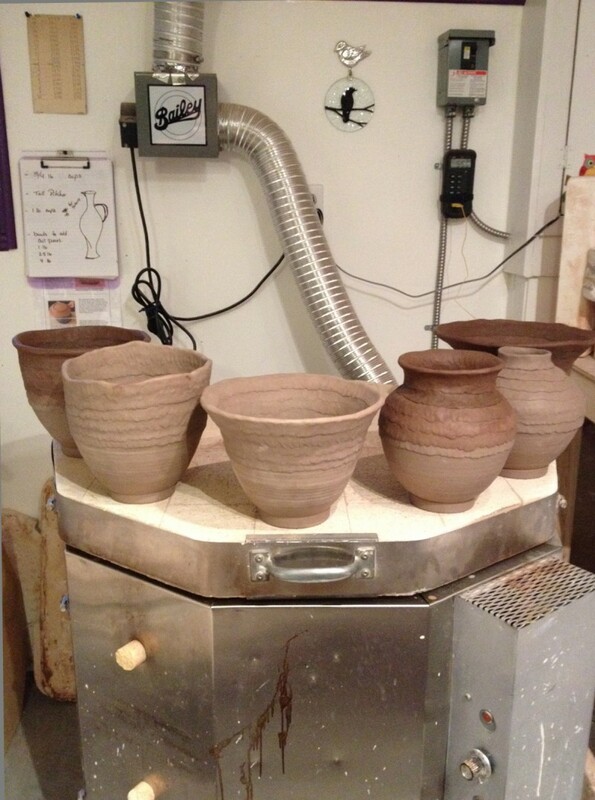 Here are the 6 pots I finished. Not all of them I love, but I sure did love making them and learned so much with each one. Here they are sitting on my kiln drying out. They were already a hard leather hard stage and the kiln was not too hot so they dried nice and slowly. 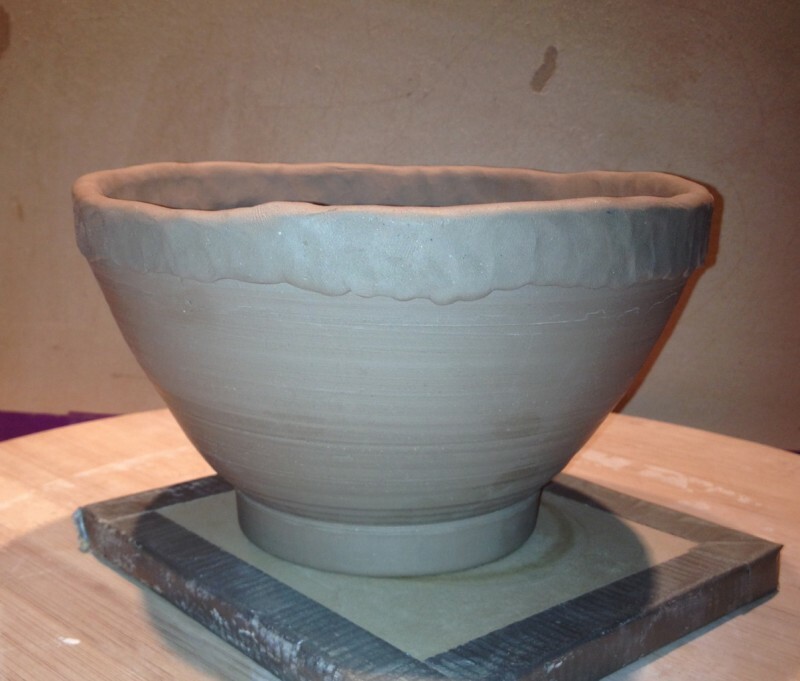 You will notice that three of the pots have red clay on them, this I wanted to try out and see not only how it would look but how it would dry together and if it would finish okay. Each type of clay has it's own shrinkage rate as well as maturing temperature as I mentioned in my last post. 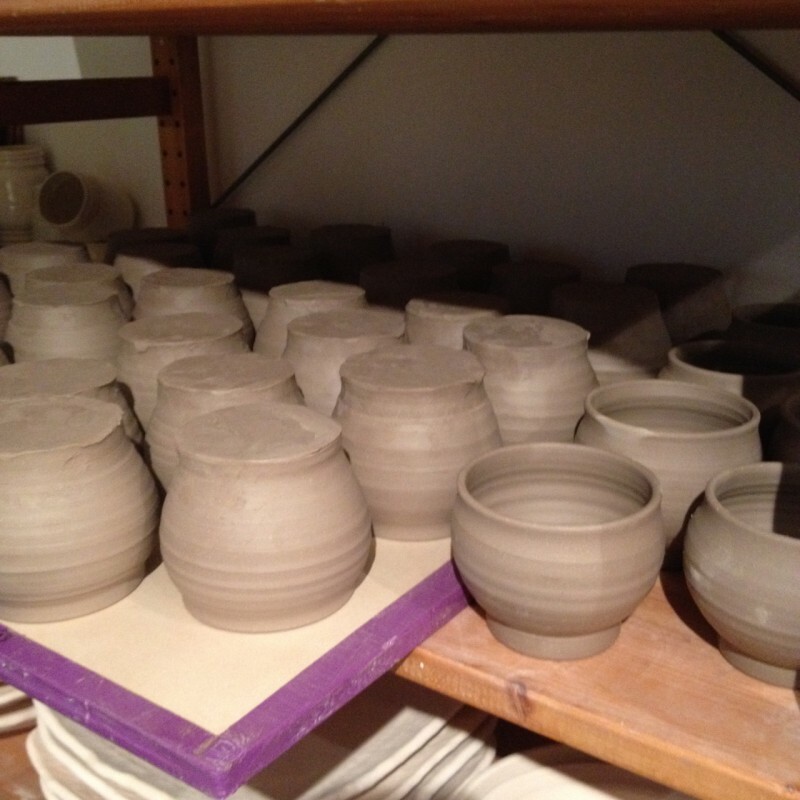 This reclaim clay matures at cone 3 but the red earthenware clay matures at a lower temperature - cone 04. A difference of about 100 degrees celcius. Normally, I would not try to mix two different clay bodies like this but since I was in the mode of experimentation I figured to give it a go. Well!!!! I love it!!! It turns out they are quite happy to be married together and seem to have no trouble staying together. There was no cracking in any of the stages and after they were glazed I tested them by putting them under different stressors to see if they would crack. So far so good! I love how the red clay pieces look glazed too. The red clay that I used here is actually Homer Lord's clay. Homer Lord was a studio potter in Halifax for years and a teacher at NSCAD, he passed away about 20 years ago. I recently went over to his widow's house to salvage two garbage cans of his clay - this stuff has been in her basement for over 20 years and it was still moist! It is a beautiful blend of Lantz clay with who knows what else but I have about 300lbs of it now and I can't wait to use it more. This one turned out to be my favorite one (so far) and you will have to come to the show to see the finished piece! I made a group of cups for one piece in this show. They are just sweet little cups that I made in multiples to express a simple and single idea. 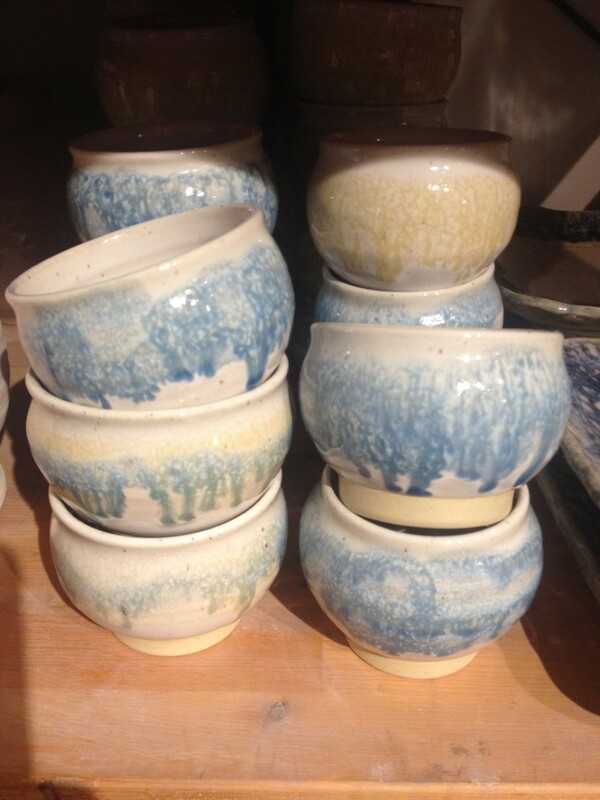 One of my favorite artists Ehren Tool just makes cups to express his ideas. I would love to meet him and am intriqued by his ideas and how he chooses to express them. It was him I was thinking about when I made these cups. A quote from his artist statement: "I believe the cup is the appropriate scale to talk about war. The cups go into the world hand-to-hand, one story at a time." I love his idea of the cup being a story to be told hand-to-hand. I made 35 cups and the grouping will be called Invisible Scars. I want it to express my idea about the scars on the inside that no one can see but are a significant part of our story. Here they are as I am working on trimming them. And then as they are finished and stacked on the shelf. For me this is probably the most powerful piece of the show as they represent what most of us don't talk about, what we don't share, what we find most vulnerable. So, that's it for today. The kiln should almost be ready to unload and I have some finishing to do on a couple of pieces and then pack them up. Please leave a comment and let me know what you think.